Mixtures of flammable gases, vapors or dusts and oxygen or air are explosive when present in certain mixing ratios. 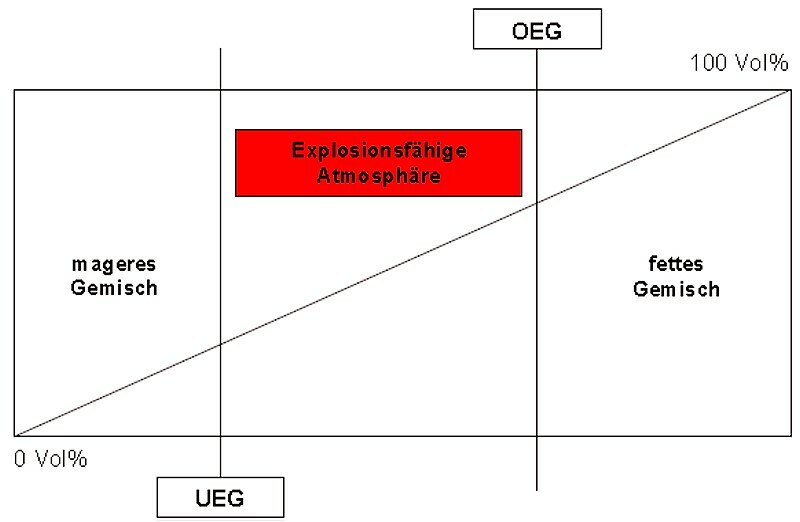 The range spanning all the explosive mixing ratios is defined by two explosive limits, the upper and lower explosive limits (UEL and LEL, respectively). These limits are also called flammability limits. The range below the lower explosive limit, in which the concentration of the flammable substance is too low, is also known as lean mixture. The range above the upper explosive limit is referred to as rich mixture. In this range, the concentration of the flammable substance is too high to explode. However, a rich mixture can be further diluted by the ingress of air and fall below the UEL so that it could still cause an explosion (Fig. 1). Explosive limits are temperature- and pressure-dependent. With dusts, they are additionally influenced by the particle size and particle size distribution of the solid. If the concentration of the flammable substance in the air lies within the explosive limits, the mixture is referred to as an explosive atmosphere. The substance concentration of the flammable gas or vapor is indicated in % vol., mole % or g/m³ (not only for explosive limits), with the following relationship applying to ideal gases: 1 % vol. = 1 mole % = 10,000 ppm. The relevant values are part of the safety-related characteristics and can either be found in the safety data sheets on the individual substances or in standard reference literature or databases. These characteristic values are determined by means of standardized instruments. Like almost all safety-relevant characteristics, explosive limits depend on the equipment used for their determination. Therefore, operating conditions deviating from the standardized conditions invalidate the explosive limits found in reference tables.